Today (2nd Thursday of March) is World Kidney Day. This day is a global health campaign celebrated every year all across the world in order to raise the public awareness about the kidneys importance and its contributions to the overall health. It is celebrated to make the common public aware about the diseases and problems of the kidneys in order to reduce the occurrence of kidney diseases as well as all the associated health problems of the kidneys. 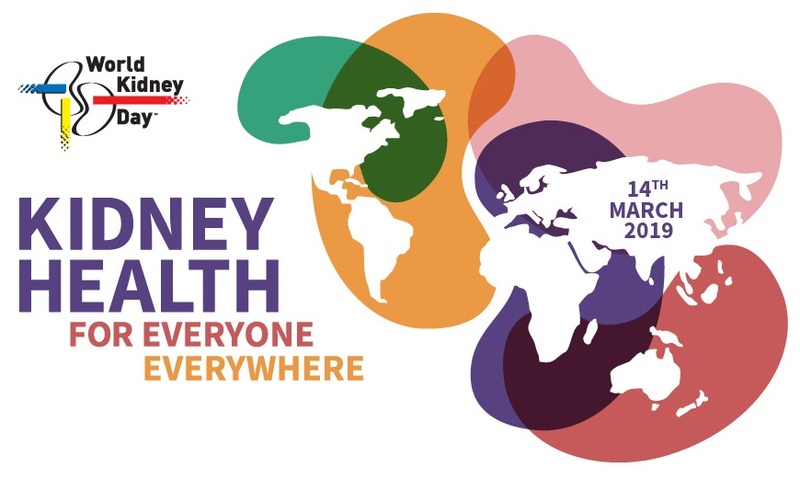 Theme of World Kidney Day 2019 : 'Kidney Health for Everyone Everywhere'. The world observed 'Pi Day' today to celebrate March 14 (3/14), which coincides with Mathematical constant Pi's value (3.14). Pi denotes the ratio of the circumference to the diameter of a circle in Mathematics. The proposal was moved by France the UK and the US on February 27, on the backdrop of Pulwama Terror Attack. The UK's Parliament members have voted by 312 to 308 to reject the idea of Britain leaving the European Union (EU) without a deal. The Parliament will now vote on whether to ask the EU for permission to delay the date for departure, which was scheduled for March 29. Earlier, the MPs had rejected PM Theresa May's Brexit deal. The Indian Embassy in Nepal announced 200 scholarships to meritorious Nepali students for continuing various undergraduate courses at colleges and universities. The Golden Jubilee Scholarship scheme was initiated by the Indian Government in 2002 to mark the completion of 50 years of India-Nepal Economic Cooperation. During the inception of the scheme, 50 meritorious Nepali students were awarded the scholarships. This year, the scholarships recipients cover 36 undergraduate courses including MBBS, BDS, BE, BSc and BBA. The 1st meeting of the 3-member mediation committee on Ram Janmabhoomi-Babri Masjid land dispute case was held at Ayodhya today. The committee headed by Justice Fakkir Mohamed Ibrahim Kalifulla (former Supreme court judge) was attended by panel members spiritual guru Sri Sri Ravi Shankar and senior advocate Sriram Panchu and several litigants from both sides. The Cabinet today approved the proposal for India’s Accession to the Nice, Vienna and Locarno Agreements, that would harmonise the classification systems for examination of trademark and design applications, in line with the systems followed globally. The accession will also facilitate in exercising rights in decision-making processes regarding review and revision of the classifications under the agreement, said an official statement. The list, now 15 countries long, was 1st drawn up in 2017 in the wake of several scandals, including the Panama Papers and LuxLeaks, that pushed the EU into doing more to fight tax evasion by multinationals and the rich. 7 countries (Aruba, Belize, Bermuda, Fiji, Oman, Vanuatu and Dominica) are to be moved back from a grey list because reform commitments had not been met. The United States and India have agreed to strengthen security and civil nuclear cooperation, deciding to build 6 US nuclear power plants in India. This commitment was made at the 9th round of the India-US Strategic Security Dialogue held in Washington DC yesterday. Indian delegation was led by Foreign Secretary Vijay Gokhale, while the US delegation was led by Andrea Thompson, Under Secretary of State for Arms Control and International Security. Note : US has been looking to sell more energy products to India, which is the third-biggest buyer of oil. The Administrator of National Aeronautics and Space Administration (NASA) Jim Bridenstine today announced that the 1st person on Mars is likely to be a woman. Bridenstine also revealed the next person on Moon is likely to be a female too. This comes after NASA's recent announcement that it will carry out the first-ever all-female spacewalk at the ISS on March 29, near the end of "National Women's Month". To commemorate late scientist Stephen Hawking, who passed on this day (March 14) in the year 2018, UK's Royal Mint has unveiled a 50 pence coin with a black hole on it. In 1975, Hawking had published a theory stating that black holes aren't entirely black and glow slightly. The commemorative coin aims to celebrate the life and “ground-breaking” achievements of Hawking, who passed away in 2018. The coin was designed by British engraver and printmaker Edwina Ellis. The coin features Hawking’s name in capital letters above a rippling drawing of concentric circles, intended to represent a black hole. The coin also features the formula of arguably Hawking’s most important scientific contribution. The coin is available in gold, silver, and a double thickness silver version called a piedfort. President Ram Nath Kovind today conferred 3 Kirti Chakras and 15 Shaurya Chakras to Armed Forces Personnel for displaying conspicuous gallantry, indomitable courage and extreme devotion to duty. Mr Kovind conferred the Gallantry Awards and Distinguished Service Decorations at the Defence Investiture Ceremony at Rashtrapati Bhavan. Two Kirti Chakras and one Shaurya Chakra were given posthumously. The President also conferred 15 Param Vishisht Seva Medals, 1 Uttam Yudh Seva Medals and 25 Ati Vishisht Seva Medals to senior officers of the Armed Forces for distinguished service of an exceptional order. The World Economic Forum (WEF) today announced the 2019 Young Global Leaders list, which included 127 individuals from across the globe. Special Olympics World Games 2019 began at Abu Dhabi (UAE). The event has made history by welcoming a record-breaking 200 nations at the Games. Of the 200 nations, 195 will compete in the Games and five will observe. Held in the West Asia for the first time, 7,500 athletes will take part in 24 Olympic-style sports over 7 days. With the highest number of women taking part and the largest number of Unified teammates on board, the World Games will capture the attention of the globe.